A three-day Blackberry service outage last week in parts of the United Arab Emirates once again demonstrates the value of “distracted driving” laws. According to an article in The National, an English-language paper in Abu Dhabi, traffic accidents in Dubai last week fell 20 percent from average rates on the days when BlackBerry users were unable to use its messaging service. 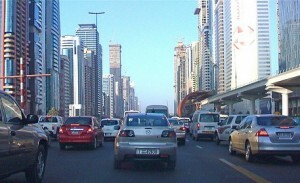 In Abu Dhabi, the number of accidents last week fell 40 percent, and there were no fatal accidents. According to the article, on average there is a traffic accident every three minutes in Dubai, and a fatal accident every two days in Abu Dhabi. Abu Dhabi recently launched a campaign against cell phone use while driving and plans to use electronic evidence in traffic cases. The article quotes the chief of Dubai Police as saying, “We have the capability to know who sent what when, and if an accident occurs while someone was messaging we will prove it and present the electronic evidence to the Public Prosecutor, and charge the driver with the costs of retrieving that evidence”. On a side note, we’d love to see a study comparing the rates of traffic incidents across service providers in the U.S. — we suspect AT&T iPhone users must be extremely safe drivers, relative to Verizon that is. It would be of far less consequence, but similarly interesting, to see whether the time people use to go to the bathroom has changed with the proliferation of smartphones. It is tempting to believe that this is true, but this situation has been presented hundreds of times here. It is just as easy to believe that they were standing in line at the Apple store after their Blackberries went blank. Not many traffic accidents there. I just read the article in the link and I have some problems with the following sentence: "The precise statistics for traffic accidents in the two emirates this week were not revealed to The National." So just because "Lt Gen Dahi Khalfan Tamim, the chief of Dubai Police, and Brig Gen Hussein Al Harethi, the director of the Abu Dhabi Police traffic department, linked the drop in accidents to the disruption of BlackBerry services between Tuesday and Thursday" it is true? I also find the figure of a fatal accident every two days quite high for a country (Emirate) which has an estimated population of 1,19 million people. how is Emirate number is "quite high"? Well because where I live, The Netherlands, that number is around 50 per million for the past couple of years (The EC calculated it at 50 in '04). In 2010 we had 640 "traffic-fatalities" and a population of 16.5 million, which gets us around 40 (38.78). And by traffic-fatalities they mean all traffic related deaths, not just fatal car accidents. How does this demonstrate the value of distracted driving laws? If true, this show that distracted driving is a problem (no surprise really). It does not show that a law would prevent drivers from checking email while they drive. Well... looking at the data before and after the law would demonstrate the "value" of the law, if you define value as "effectiveness", which I think you do. But "value" could have also meant the "worth" of passing the law, of pursuing this law to begin with, that it's a noble thing, etc. Maybe we should have a 'No Signal day' every year - and see how this changes the way people behave - maybe the better driving will be complimented by people talking to each other. I'm willing to bet there are more accidents caused by blackberry and iPhone users over androids. These makers have been slow to implement more talk to text, predictive text and auto complete features. These same features are available even on the most basic androids.